The Blumenau Oktoberfest is the second largest Bavarian Beer Festival in the world, and takes place in the first two weeks of October. You can enjoy the parades through the city and the live music and dancing of the Vila Germanica afterwards, as well as some of the scenery, culture, beers and cachaças of Santa Catarina. Your time in Santa Catarina can be adjusted to match your requirements, either concentrating on Blumenau and the Oktoberfest for a shorter trip, or combining with more time at the beaches nearby for longer stays. Best Time to Visit: October! 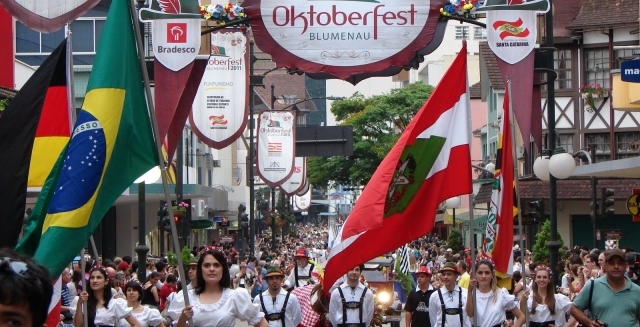 Unlike the German Beer Festivals, the Blumenau Oktoberfest is always held in October, usually immediately after the ones in Munich and other parts of Bavaria. The best bands from Germany come over to play in Brazil after they have finished the festival season at home. Day 1 : Arrive in Santa Catarina for Oktoberfest! On arrival at the small airport of Navegantes on the Santa Catarina coast in South Brazil you will be welcomed and transferred to your hotel in nearby Balneario Camboriu. This coastal city is known as a mini-Rio, with beautiful beaches lining the bay. You have the rest of the day to relax, enjoy the beach, and perhaps take the cable-car ride up the headland at the southern end of the city beach and over to Laranjeiras. The views from the top show you the whole city, the paragliding ramp at the far end of the beach, offshore islands, and the hills and mountains of Santa Catarina behind. Evening is free with Balneario Camboriu having a permanent holiday atmosphere. Day 2 : Oktoberfest Opening Parade! The city of Blumenau was founded by German immigrants who came up the Rio Itajai-Açu in 1850. A tour of the town lets you learn a little of the history, and also to see the boat that brought 18 people across the Atlantic to build new lives. Blumenau and some surrounding towns still retain their German culture, and some people in the region still even speak German as a first language. The largest manifestation of German culture is in the Blumenau Oktoberfest, which locals will tell you is the second largest in the world, after Munich. The Opening Parade takes place on the first Wednesday of October down Rua XV, the main street of Blumenau. 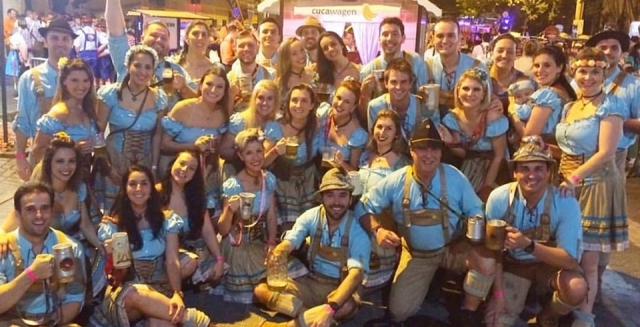 The 2018 Blumenau Oktoberfest will be the 35th edition of the famous beer festival. It began as an event to cheer up the local people and economy during the huge floods of 1984, after the Rio Itajai-Açu burst its banks. 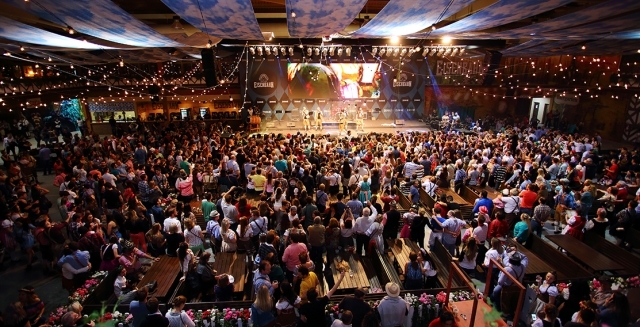 Blumenau already had a great reputation in Brazil for the quality of its beer, and the festival grew quickly to become a major national and international event. 700k people visit every year for the 17 days of Oktober, usually from the first Wednesday of the month until the Sunday two weeks later. The huge pavillions offer free entry to those dressed in lederhosen and dirndl, and Oompah bands travel from Germany after the end of the festivals there. Day 4 : Santa Catarina Beers & Cachaças! A tour of the valleys around Blumenau takes you to some of the Santa Catarina towns that have retained their European feel. Pomerode is perhaps even more Germanic than Blumenau and sits in a beautiful lush valley, overlooked by small mountains. The views over this valley and neighbouring Timbo can be enjoyed from the paragliding ramp on top of Morro Azul. Visits to local breweries should of course make part of your stay, with Eisenbahn and Das Bier in Blumenau, and Berghain and Borck in Pomerode. This is still Brazil so a visit to a traditional cachaça alambique is also essential! Cachaça Dupipe is one such place, hidden in the Santa Catarina hills. 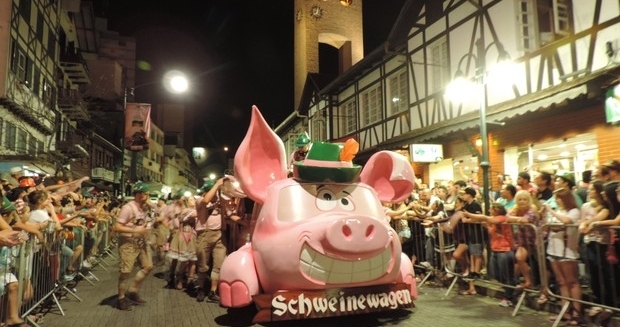 The Blumenau Oktoberfest Parades run on the opening Wednesday and Saturdays through the city centre, then everybody continues walking to the Vila Germanica pavillions, which open at 6pm every night. Regional and international beers are on show, plus the traditional German bands, outfits and foods. Your days can be as relaxed as you want them, with time for the beaches of Balneario Camboriu, or even a tour of Florianopolis an hour to the south, with transport provided for as many evenings as you need in Blumenau! Staying in Blumenau for at least one night is a good option to make the return journeys to your hotel much easier. Day 6 : Auf Wiedersehen Blumenau! Your Blumenau Oktoberfest Tour comes to an end with the journey back to the airport in Navegantes. Florianopolis is only an hour away as well, and you can even spend some more days there to enjoy the beautiful island beaches. There are also more beaches such as Praia Brava in Balneario Camboriu, which also has some of the best clubs in Brazil for more regular nightlife, including Warung and Green Valley. We can arrange your trip for as many days as you like between 3-21 October 2018, and also combine Oktoberfest with any other destinations in Brazil, such as Rio de Janeiro and Iguazu Falls.